Home REGIONAL WHOA! Can You Guess The Budget Of Rajinikanth’s Robot 2? WHOA! Can You Guess The Budget Of Rajinikanth’s Robot 2? 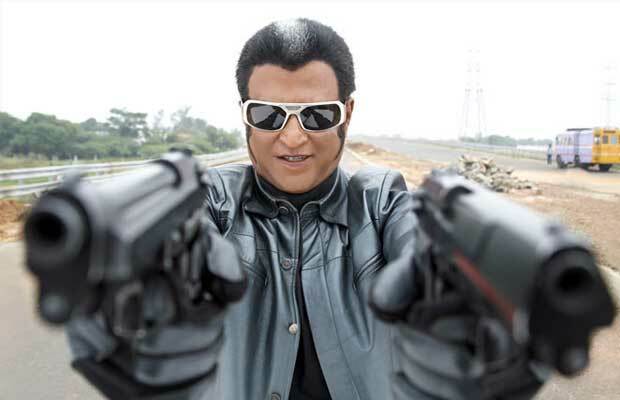 [tps_footer]Rajinikanth is making major moves with his upcoming movie ‘Robot 2′ (Enthiran 2), and now the latest buzz is due to the estimated budget of the film. Talks of the film’s budget being around Rs. 150 crores approximately were spreading like wildfire a while back, but now it seems the budget will be double of that. Yes! The estimated budget of ‘Robot 2′ is somewhere between Rs.250-300 crores which makes it India’s costliest film till date. Few of the reasons for which can be the high-fi VFX, Hollywood level costume as well as involvement of Hollywood actor Arnold Schwarzenegger. Well 250 crores is not a child’s play and if the number is in fact that much, it is seriously going to break the Internet and the anticipation as well as nervousness will rise threefold. ‘Robot 2′ has already entered its pre-production stage with Rajinikanth and daughter Aishwarya Dhanush visiting Los Angeles for the makeup and costume trial recently. As we reported earlier, Amy Jackson was also present in LA before for her costume trail at the same place which made the attires for Shankar and Vikram’s venture ‘I’. London based billionaire Subaskaran Allirajah is the one behind the production of ‘Robot 2’ with his company Lyca Productions. One of the reasons behind such a huge budget can be the sum demanded by Hollywood star Arnold Schwarzenegger who is alone asking for something around Rs. 120 crores net approx to be the film’s villain. Needless to say, he will also be adding that much brand value to the film with his past record of sci-fi film series ‘Terminator‘. Previous articlePhotos: Sunny Leone, Anil Kapoor And Raveena Tandon’s Fashion Filled Night! Next articleWatch: Batman V Superman Exclusive Sneak!